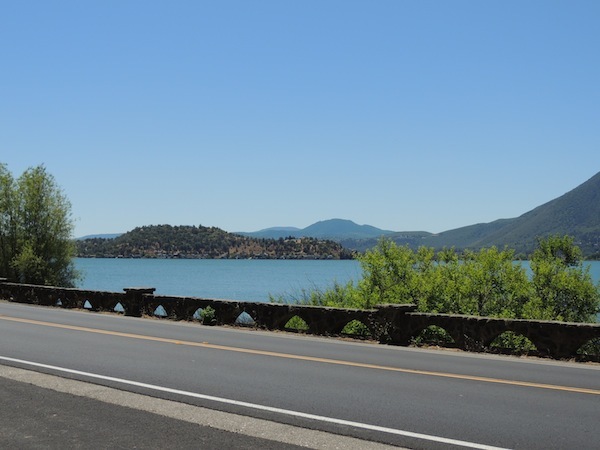 The ride along Highwayt 101 has been enjoyable with its changeable views, wooded roads, beach scenes, small towns dotted along its winding path. I noticed that many of the bridges had long, arched spans with unique building like icons at their entrances. Somehow these bridges seemed similar. Well, they were designed by the same architect, after WWI. 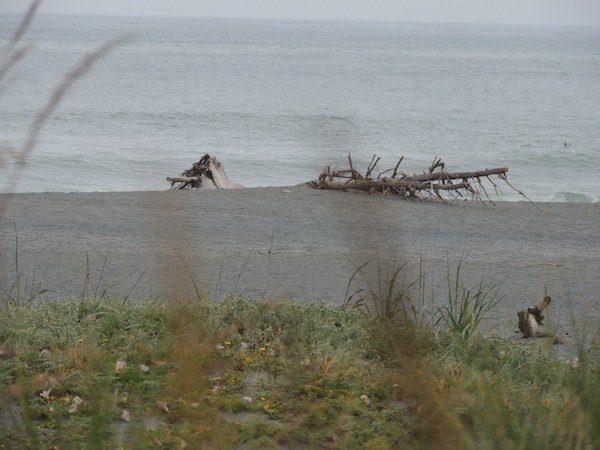 Roosevelt felt that the Oregon coast at that time was not defensible in case of an attact from the Pacific Ocean. There was no continuous road to move troops along its coast line. So during the reconstruction of the country after the Great Depression, Roosevelt decided to use public works efforts to build the 'now present' HWY 101. It was first called the "Roosevelt Military Highway"; I'm glad this name has been lost to history. 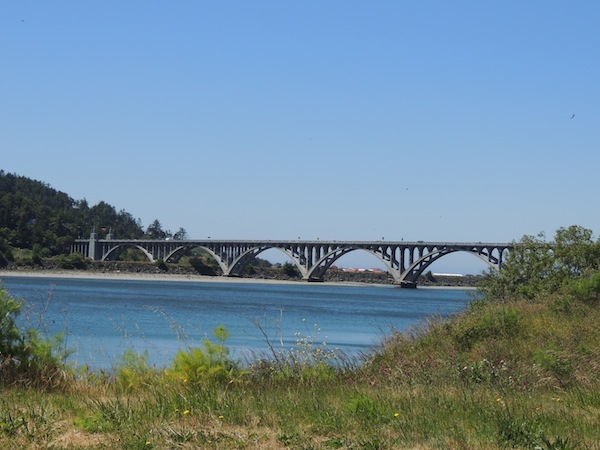 Conde B. McCullough was the master architect for the Coast Highway. He wanted to combine efficiency, economics, and asthetics in creating these wonderous bridges. His works still stand today. Today was a late start, just hanging around the motel getting the blogs updated and realizing that a rest day was coming. 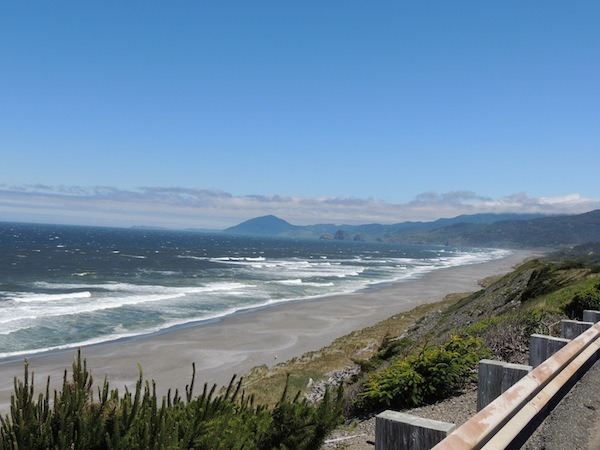 So the goal today was to drive a couple hundred miles, enjoy the scenery, take some pictures, see and feel the Oregon coast. Then tuck myself in to some place for a whole day rest, do some laundry, take some hikes, see the beaches, whatever can break up the trip. So my $5 purchased a great London Fog jacket with a zip out warm liner, a beanie cap, and a beautiful warm scarf to keep my neck warm where the jacket and helmet meet. Such an organized thrift store! 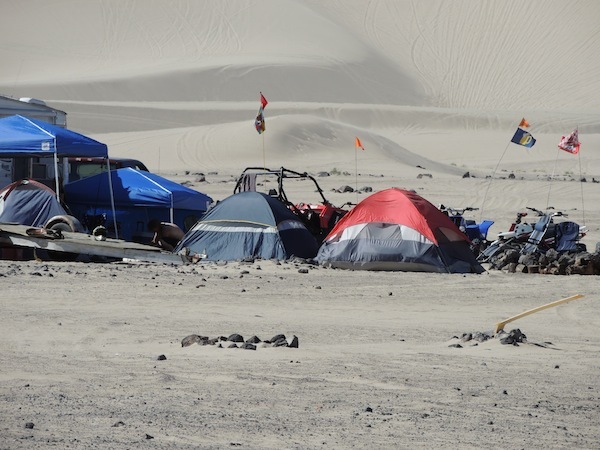 They were remarking that they also feed meals each day and that there has been a rise in the number of attendees from 24 to 40 in the last several weeks: economic times are hard in Oregon. Odometer reading 4538 miles (7303 kilometers)! So off we go, warm as toast in the 55F, windy, moist weather. 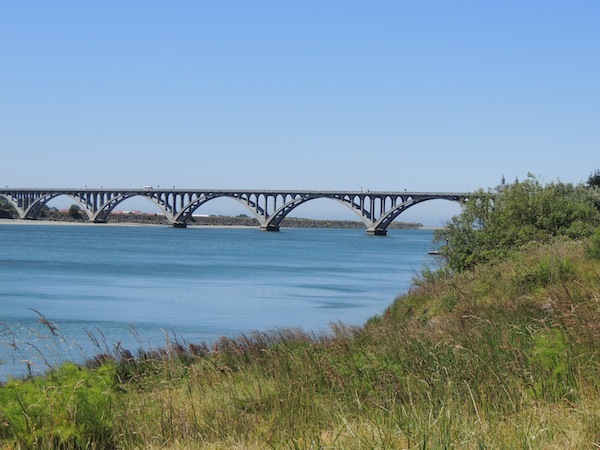 First I left Gold Beach over a beautiful arched bridge. 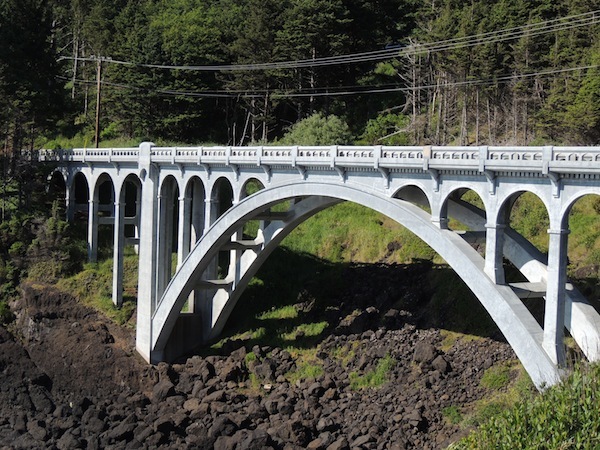 There are so many bridges along this coast line. 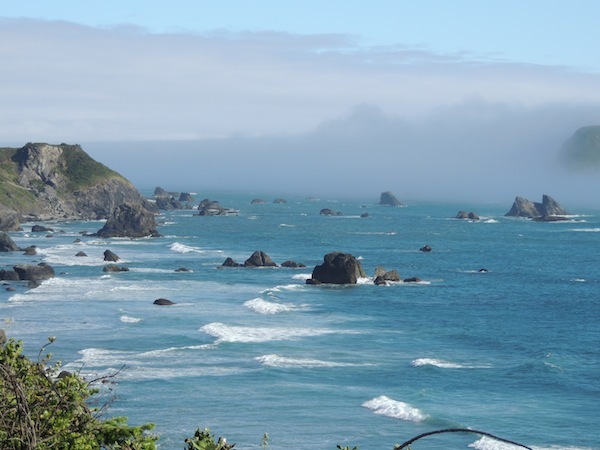 This is a great shot of a typical Oregon Coastline. 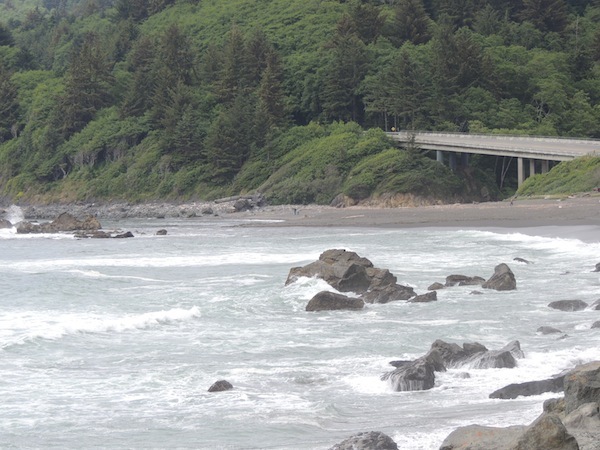 Highway 101 is the western most US highway in the United States. Odd numbered roads go North and South. Even numbered roads go East and West. 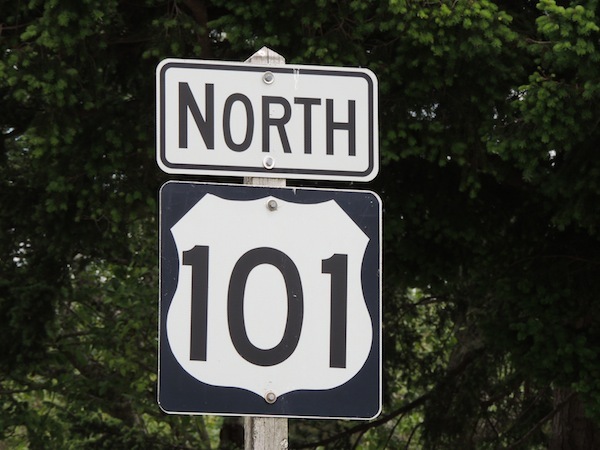 Highway 1 is on the East Coast and thus 101 is on the Western side. This road runs through most of California (it has been consumed by some Interstate sections in southern California) through Oregon and Washington. It has the characteristic of going 'through' towns and not around them like the Interstate system. It has 2 lane, 3 lane, and 4 lanes at times. It is divided, separated, and subject to cross traffic all along its path. 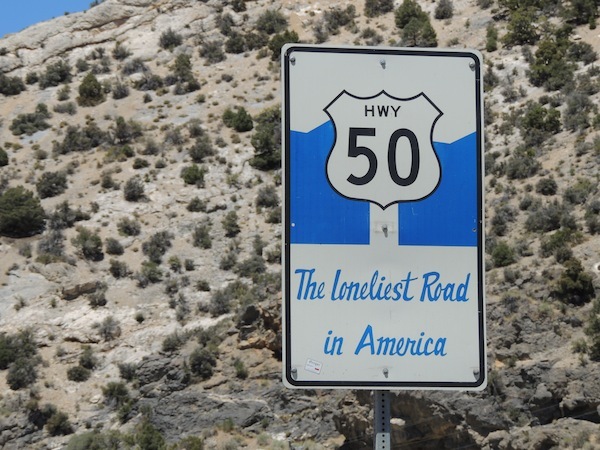 Average speed is much slower than the Interstate system which often parallels it, however, you get to see the sights, read the signs, and take in the surroundings much better. 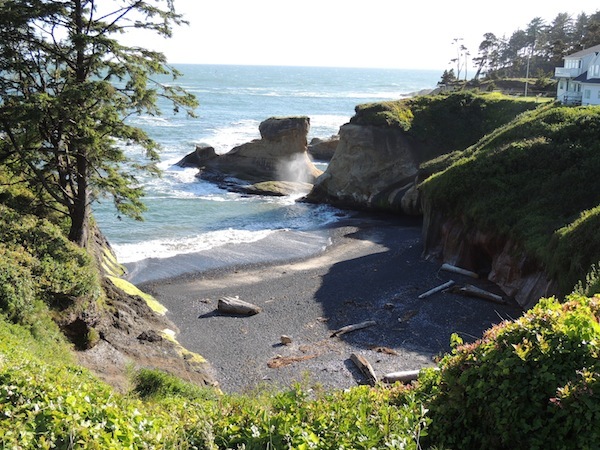 The sea lion caves just north of Florence, Oregon are the largest in the world. 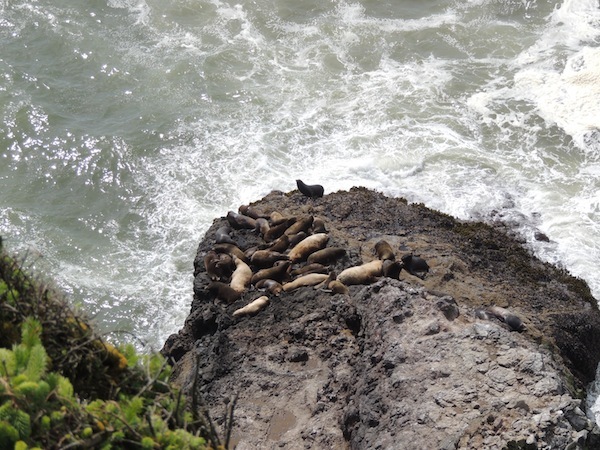 I didn't go to them but there were some 'free' seals that did not like caves and were in viewing range along the highway just north of the caves. They looked a bit lazy in the sun, just barking and taking in the sunshine. Here is the link for the caves if you wish to go there sometime, or learn more. 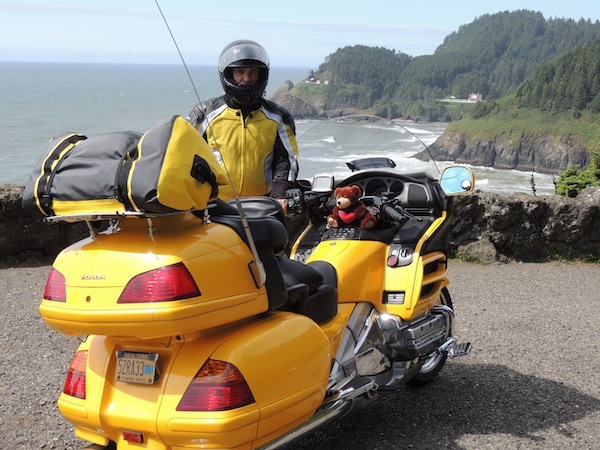 This is what the well dressed motorcyclist looks like. Warm is the word! 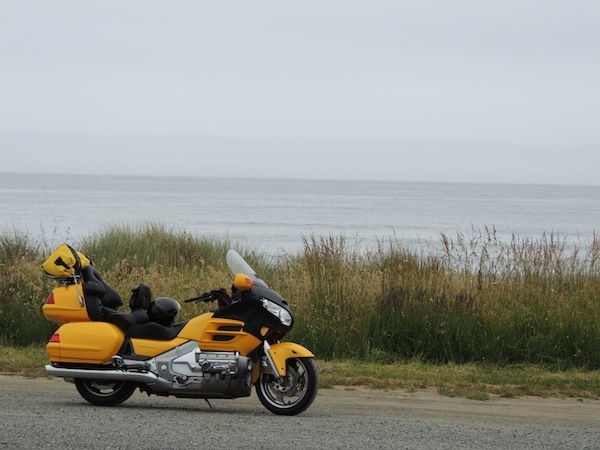 Stopped at Depoe Bay about 200 miles for today. 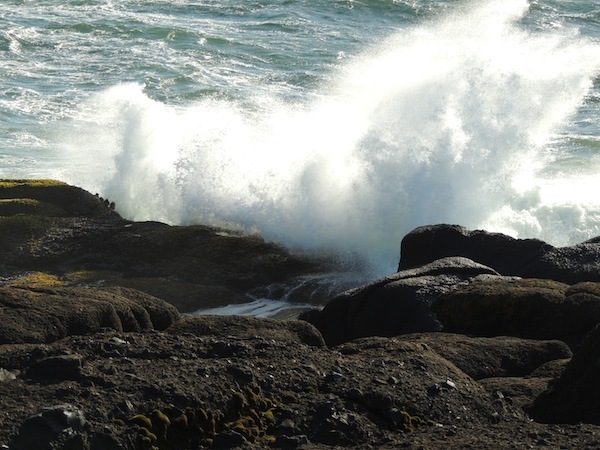 Great views of the wind stirred ocean, beaches and 'water meets rocks' at the beach called the 'Boiler Bay' just North of the town. 3/8 of a microwaved pizza for dinner! Great day of sun, twistys, minimum of traffic. Met the Pacific Ocean today. Cloudy and windy, showing its wild and boisterous temperament. Sandy beach with rocks offshore, beach grass, and a sort of cold beauty. 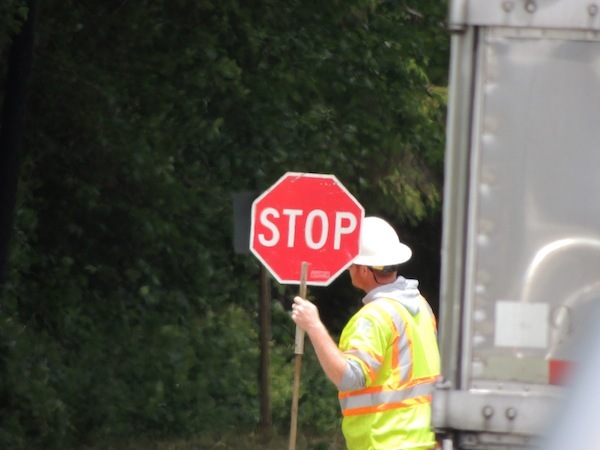 Road construction is everywhere in the summer especially where the rains or snow prevent repairs. This person represents the thousands of people who are helping to keep the construction area safe while we continue to use the roads. 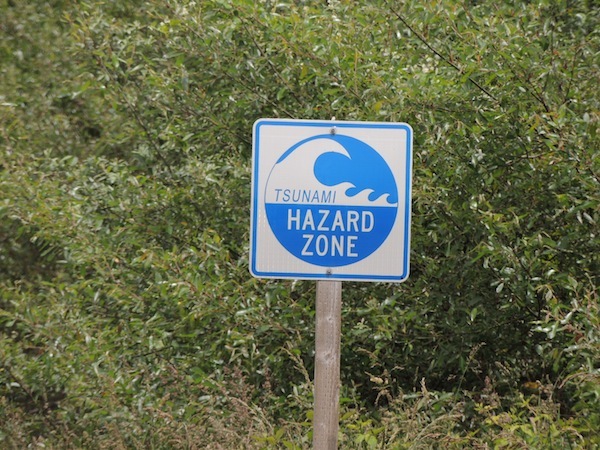 I was kind of shocked seeing the Tsunami sign. One could forget that the entire Western coast of CA, OR, WA would be greatly devastated by a large wave coming from the Pacific ocean. More Redwoods today, but at the entrance of a park where I did some hiking were some Elk munching on some grasses. A sign told us NOT to approach the animals. 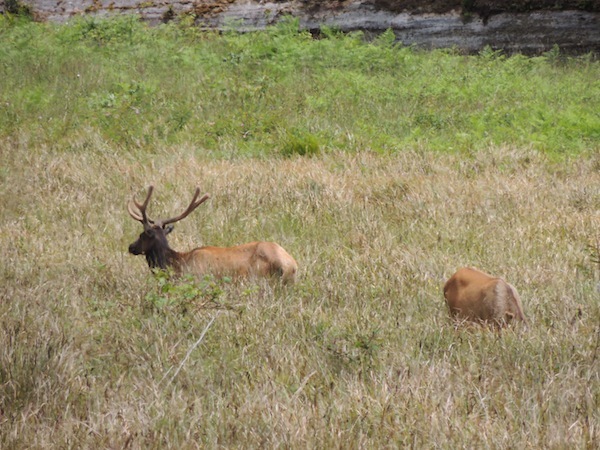 It would not be humorous to see a threatened or scared Elk in a confrontation with a human. Took a hike into the Redwoods to a place that had rhododendrons growing all over the place. In the nursery business these plants are bushy, near the ground. I had walked by many of them without noticing because these were trees! 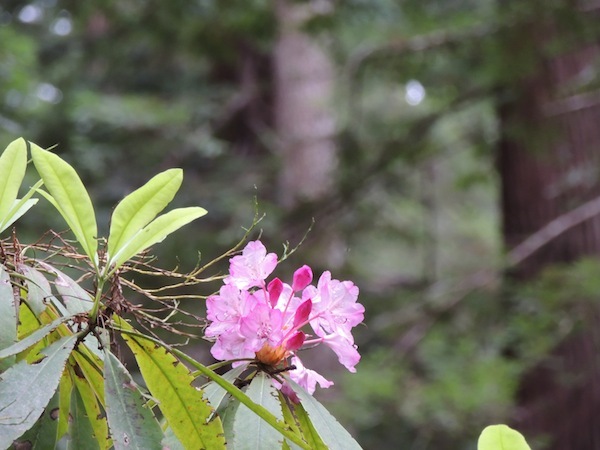 20 - 30 feet tall Rhododendrons with some blooming a pink blossom. Looks like these were the early bloomers. 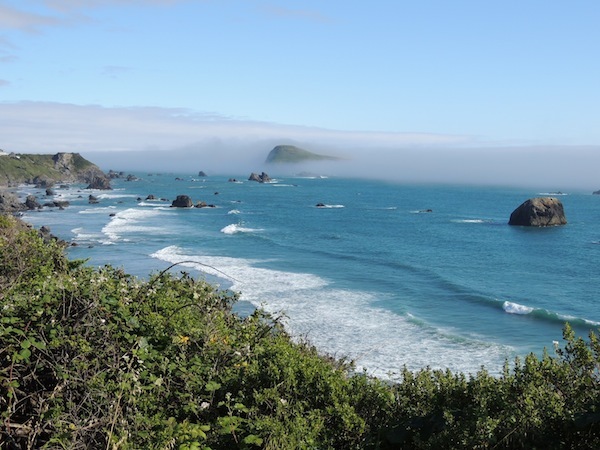 Finally the rugged coast of Northern California and Southern Oregon with a breakthrough of the sun for a moment before the fog closed in. Bright and early rise today, off to California. After about an hour driving West on I70 to get over the Sierra Nevada mountain range, I noticed it getting colder. WAY colder! At the Donner Pass summit it was 34F. 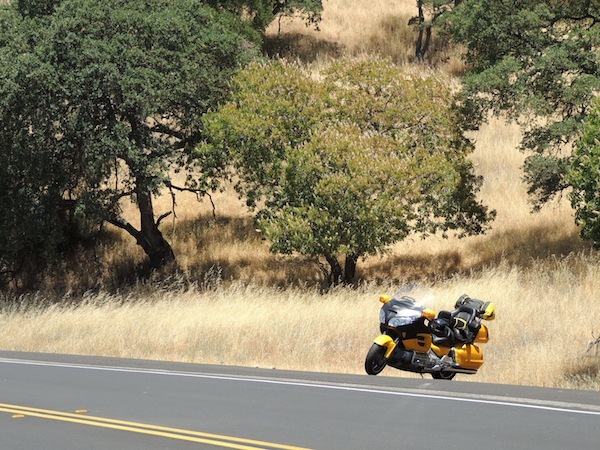 Now this is serious cold weather riding for a motorcycle. Who knows what kind of windchill this creates. I noticed that the highway department had worded a sign very clearly: Bridges may have ICE even though the roadway is clear. Congratulations on a clear sign. Most of these signs simply say 'bridges ice before roadway' which does not make sense to a person who has never driven in a colder climate. I noticed 2 of the bridges had dustings of something that I guessed was to reduce the ice buildup. 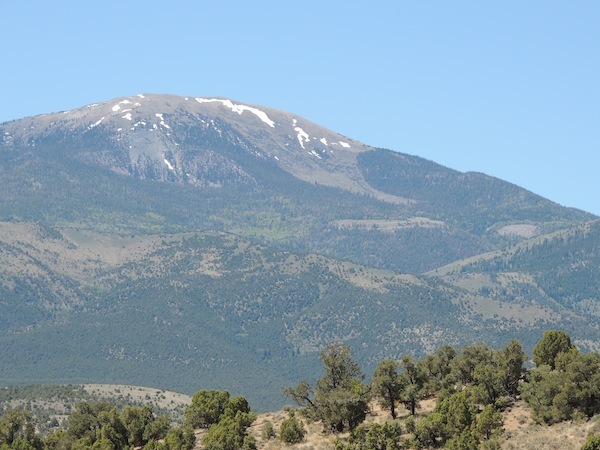 I guess at 7800 feet elevation this is a normal occurrence, just not expected by me. I left the interstate and headed West on California 20 for the next several hundred miles. This route takes one through the foothills of the mountains from where so much gold was taken in the late 1800's. 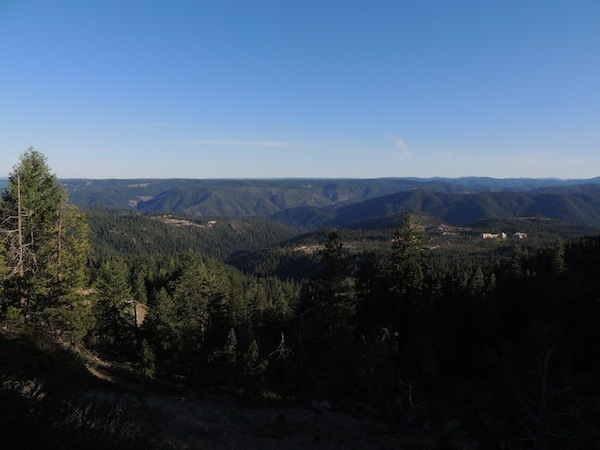 The mining area was in the area now known as Grass Valley. The interior valley of California is a HUGE agricultural region. Get water to the soil and it can grow just about anything. Nut and fruit trees, vegetables of every variety. 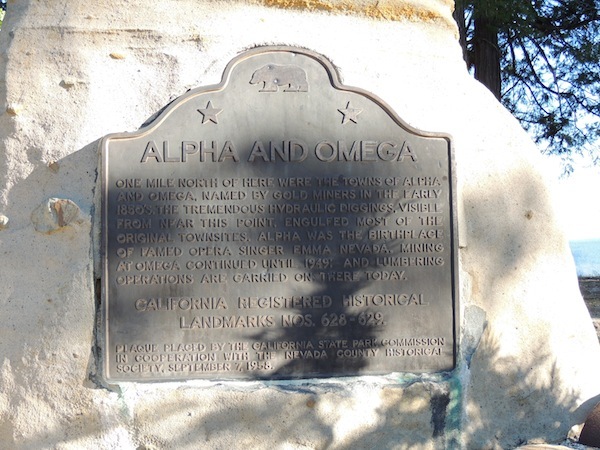 Marysville, CA is the main city through which I drove in this agricultural region. What a contrast between the rich vegetation with the dry California foothills. Aqueducts and canals bring water from several rivers to the fields. Note on Rice farming: Huge tracts of land have been leveled and flooded for rice production. Then the rice is mechanically seeded into position. We have seen so many rice paddies in Asia with so many people hand planting and care taking that these California fields seem abandoned. 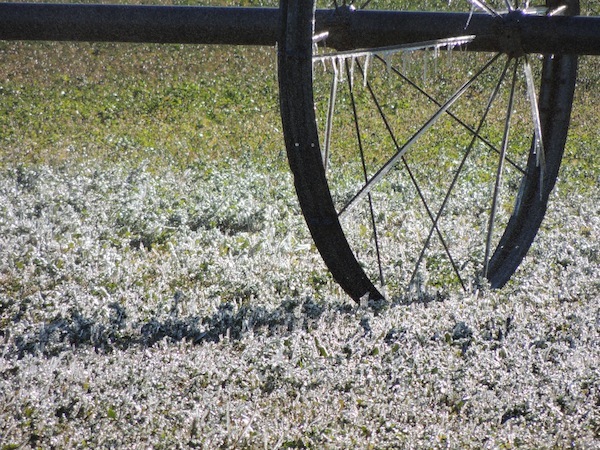 Crop dusters add chemicals to control the pests and weeds. The dry hills of California are always catching fire. Old oak trees manage to hold out in these upper temperatures. While waiting for road construction on a hot black road, the temperature reached 94F. 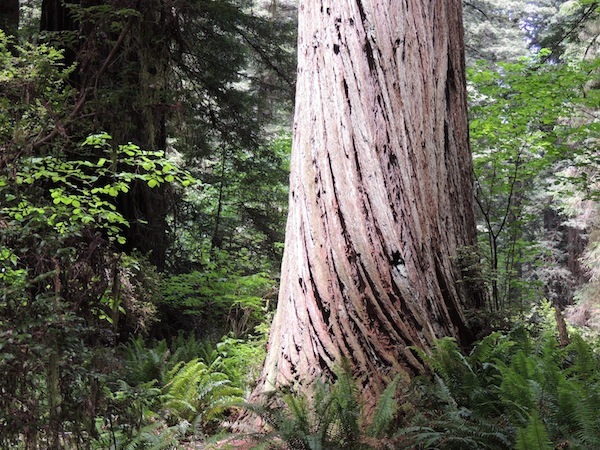 Redwood trees are amazing, old, tall, large at the base and valued for their color and resilience to weathering as used in decks and outside wood on homes. 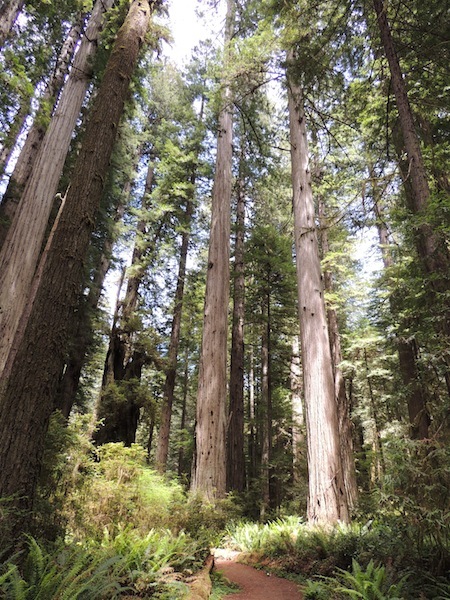 The next 100 miles of so of coastline has many locations of dense Redwood forests. Wow, was it cold. I began telling myself that I did not have enough clothing along this journey. I asked the man at the desk what temperature was it outside. He answered '72 Today', well I meant what is it now. It turned out to be 44F. I saw a small wooden bridge between the hotel and another building ICE'd over from some silly sprinklers that had been misting the grass. Even seen a field being watered in early morning and freezing as it hits the ground and metal? 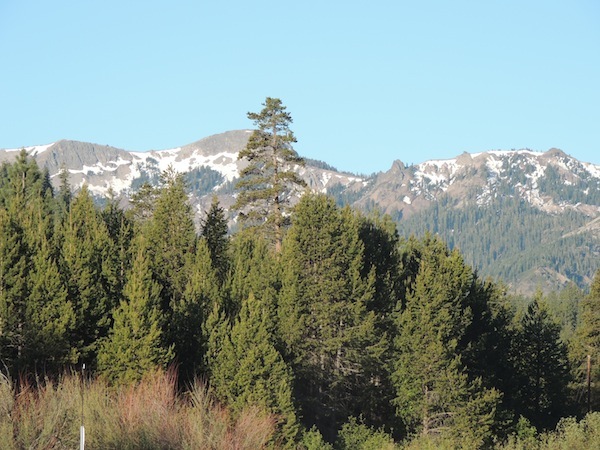 OK, some would argue that if one is at 7000 feet elevation, clear sky, then 44F is not bad. However, I had been in the 'go somewhere' mind set, and not the 'planner of details' mode. For the next 5 hours my bike and I stayed at or above 6500 feet and topping at 7700 feet. What a cold ride. Thanks goodness for heated grips on the bike. I had 4 layers on. Yet, the stunning blue/violet sky, the sun rising behind me, and mountains curves, trees, rock outcroppings stole the temperature away. Did I say that there wasn't any traffic on US50 through this section? I might see a car every 10 minutes or so. Amazingly beautiful area. This was my longest ride of the journey, 600 miles. Perhaps this was because the posted speed limits were often 65MPH. 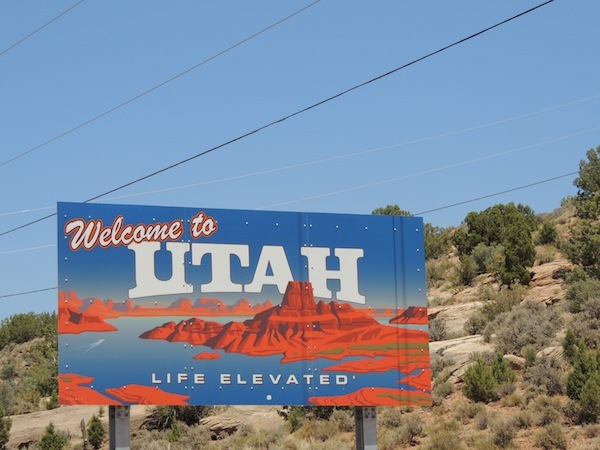 As Utah turned into Nevada, the trees started to thin, the earth showed a bit more often, and the temperatures rose. Just before Fallon, NV there was a unique outcropping of a huge sand dune. 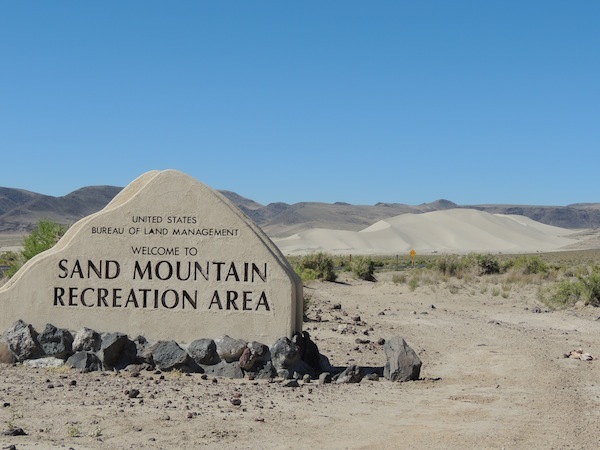 How this huge sand dune got where it is is a mystery to me, but it is there, all by itself not connected to an adjacent sandy area. 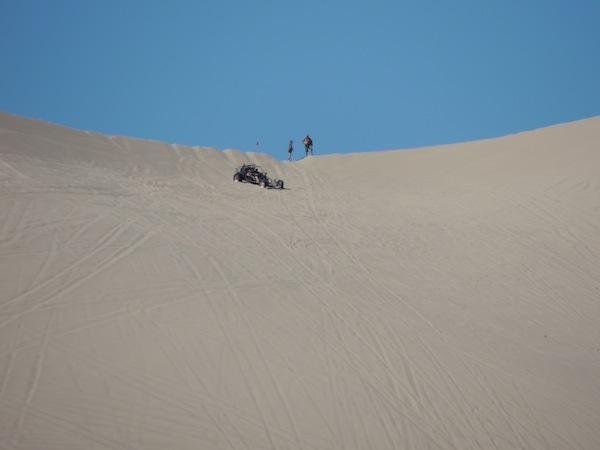 Off road vehicles, 4x4's, sand rails enjoy going up and down this huge dune. My telephoto lens really worked great to bring the cars and people into focus from far away. The Pony Express came through this desert area. Still standing are the remains of several way stations that had horses ready for the next stage. 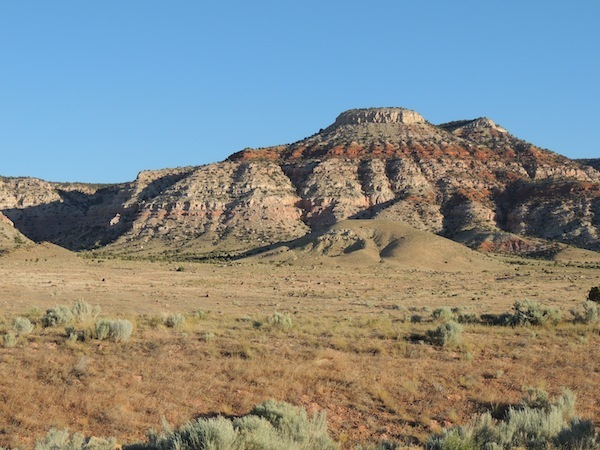 The Pony Express operated for a year and a half only. It fell victim to the technology of the telegraph. What a life for those brave and daring riders and station attendents. US50 also has many areas set aside for US Naval and Government use. LOTS of top secret planes developed and tested in this remote section of Nevada. There is a site where the B-17 bombers from WWII practiced bombing. Try looking up 'US Navy Centroid Area' and see what you get. Lots of mystery in the Fallon Area. Guess what? I was in for a 'thermal shock' leaving Sparks, NV. Read the next blog entry for Mon 11 June to find out how cold it can get on this 'summer' adventure. 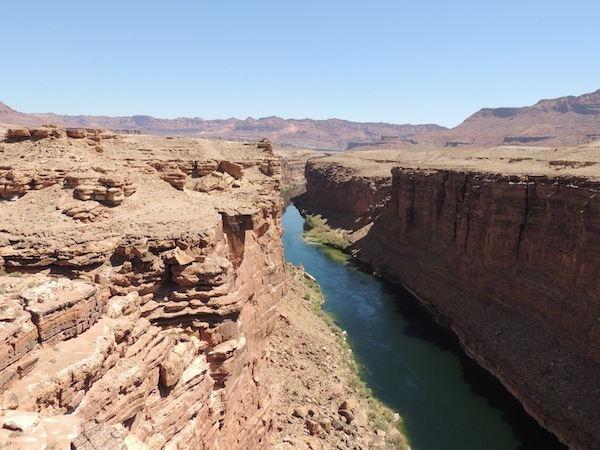 Northern Arizona is filled with vast openness, as big as the sky and wind can make it. 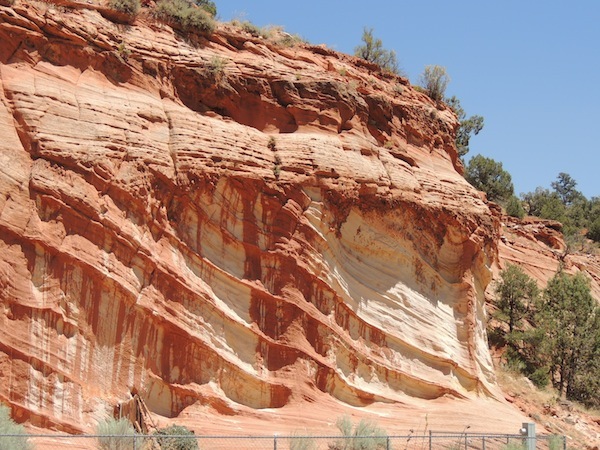 Traveling through the Navajo reservation area in mid morning, the shadows and contrasts along the red hued cliffs made for breathtaking moments. 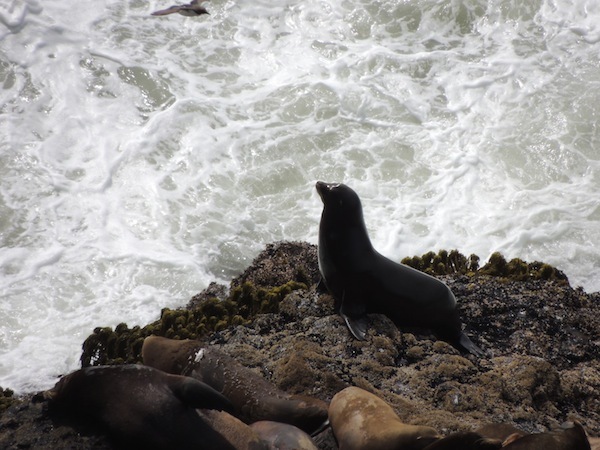 It is easy to understand how these areas became sacred - there is so much power in stillness and coloration. 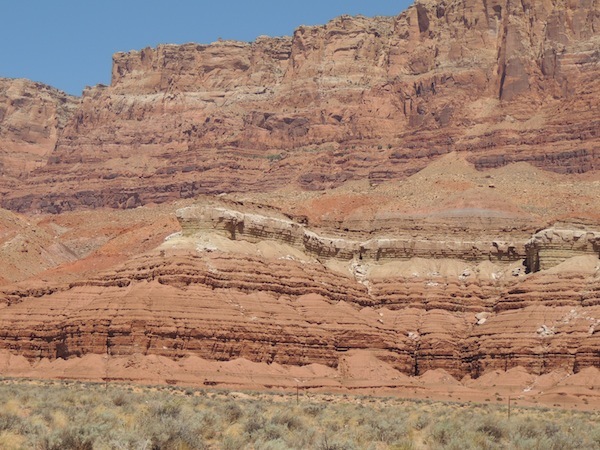 Grand Canyon, Vermillion Cliffs, Bryce Canyon and other great destinations are all located in this area. Here are some more pics from this photographic day. Ready for the first post in 9 Jun - Seattle Bound.